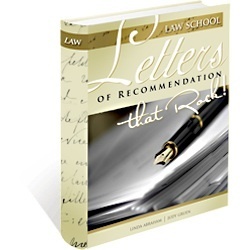 Law School Letters of Recommendation that Rock, an instantly downloadable ebook, shows you how to land winning letters of recommendation for your law school application. The six-fold purpose of letters of recommendation, and why you shouldn't overlook them. How to choose the best recommenders. The seven things you can do to make your recommender's job easier. Persuasive content in recommendations, including the eight qualities your recommenders should highlight. You can't successfully complete your law school application package without strong letters of recommendation. In Law School Letters of Recommendation that Rock, Linda Abraham and Judy Gruen show you how to obtain stellar LORs by providing practical, hands-on tips. How do they know? Linda has advised literally thousands of successful graduate school applicants over the last decade, often from the initial school selection and strategy conceptualization all the way to finalizing the last period of the last essay. Judy, an award-winning author with over 20 years of editing experience, has worked with many of our law school applicants since 1996, when she joined Accepted. Linda and Judy have seen what works and what doesn't. Practical tips to guide you through the LOR process. Two sample letters of recommendation. 9 Tips for Recommenders that you can pass along to your recommenders. Convenience - the special report is instantly downloadable. There’s no shipping or waiting. You can purchase Law School Letters of Recommendation that Rock for only $19.97. Just click on the “Add to Cart” button below and you will be taken to our simple, convenient order form. Fill it out to receive Law School Letters of Recommendation that Rock within minutes.